Listen to different radio stations during the day. Every day thousands of radio stations make beautiful programs and you just listen to one, till today! With the Flex Dynamic Radio app (Flex Radio) you can enjoy radio and listen to a different stations per hour, depending on your own personal playlist. Creating your own playlist is simple, just select any radiostation anywhere in the world from our Global Radio Database and select the days and start-time. Listen to two or more stations per day, It's all up to you. Flex Dynamic Radio gives you the opportunity to enjoy streaming radio without geographical or technical boundaries. With Flex you can create your playlist per day/week and save radiostations to your favorites. All the features shown on this website are available in the FREE version. The central radiostation database holds more than 17.500 radio stations worldwide. You can search on name, music style and country of origin. New radio stations are added on a weekly basis. 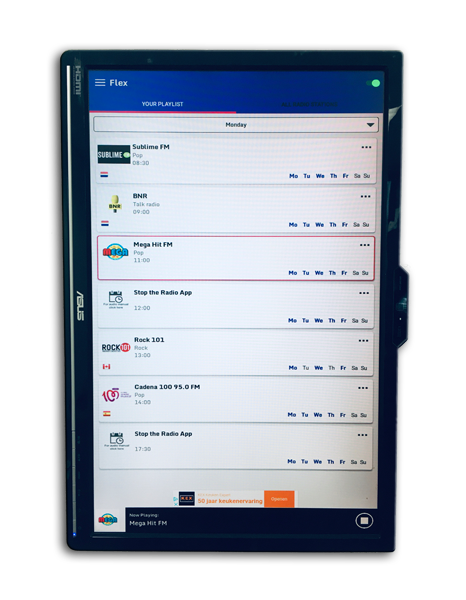 With the Flex Radio App you can create you'r own playlist and switch per hour to another station of your choice. Use a playlist per day or per a set of days. You have FULL control over the playlist and can program different station in a row. Within Flex you can create your own Favorite listing. How long the list will be, is up to you. You may add as many as you like. We have set no limit! 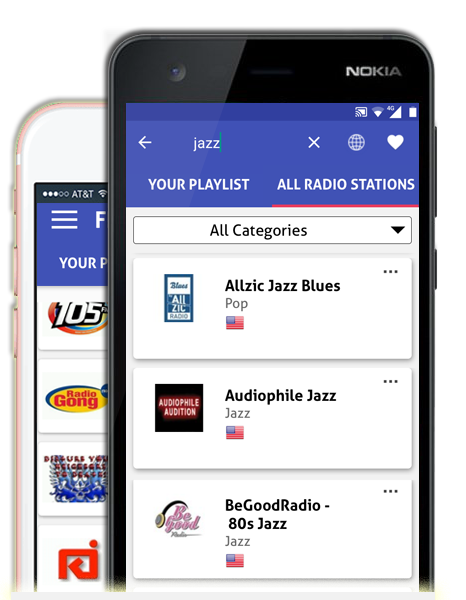 We can tell you that our Flex Dynamic Radio app is the best choice to listen to a radiostation, but we prefer not! We encourage you to download the Flex Dynamic Radio app for FREE and decide for your self. If you still doesn't like our Flex Dynamic Radio app, drop us a mail (info AT flexdynamicradio.com). You will receive a personal answer. These strong features of Flex Dynamic Radio make this Radio App stand out! If you like to enjoy more features? With an in app purchase you can unlock more options. We also care about your privacy: Our servers are using encrypted connections to the Flex Dynamic Radio app to establish trust. All personal settings like your playlist and favorite radio stations are handled using encrypted SSL connections. Create a personal favorite listing from stations anywhere in the world. The very intuitive design makes sure that you can use the app without reading a manual. We also have a spoken manual within the app. We are actively monitor the radio stations and tag radiostations in our database if they are offline. Also the App users can report a radiostation as not working. Enjoy your playlist, after you created the playlist, it will start automatically. The radiostation database is automatically synchronized with our secure datacentre in Amsterdam. Our app is completely safe! We do not sell or share personal info from our users. We only use the info to improve your user experience. If you like our Flex Dynamic Radio app? Use it! If you don't like the Google advertisements within the app? Pay for it, to upgrade your version to a Google advertisement free version. If you only like to use the FREE Version? Fine by us, you're welcome to use it as long as you wish. If you like to have your own commercials within our app or like to promote your own radio station ? Contact us! Our user interface design is kept really simple. Anyone with a phone can operate and understand it. Just select the station to play or simply tap on the three dots in the upper right corner of the station listing and select: Add to Playlist or Add to favorites. For professional use at office or at home, we present the Flex Dynamic Radio Appliance. This small eco friendly device can play your playlists for you without any phone! With the small size and low power-usage, it's the best way to use our Flex Dynamic Radio app in a professional or home environment. The Flex Dynamic Radio Appliance plays your playlists. With a analog Audio and Fiber output you can use it as an audio source on your existig audio system or amplifier. With the Flex Radio App you can create your own playlist and switch per hour to another station of your choice. Use a playlist per day or per a set of days and start and stop automatically. You have FULL control over the playlist and can program different station in a row. It only needs a onetime setup on a HDMI monitor. If you have WIFI you can connect the appliance to internet with the buildin WIFI function. Otherwise use a network-cable. We’re so excited to announce that the Flex App is available for both iPhone and Android! It’s been an amazing journey for us to get to this point over the past three years, and we’re ready to finally be launching the Flex app to the world. 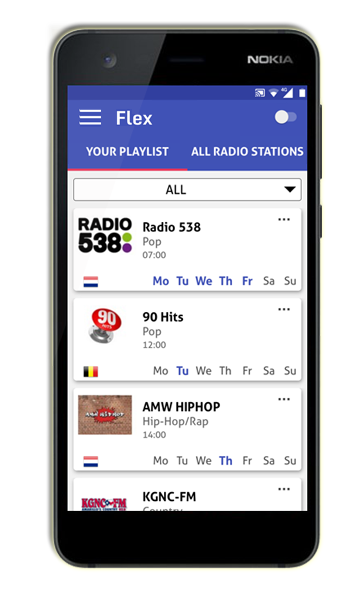 The Flex Radio app is powered by a small dutch company that is privately owned. Flex Dynamic Radio is based in Hoorn in the province of North Holland. It is located 35 kilometres north of Amsterdam. If you like to hear from us, join our newsletter. Copyright © 2018-2019 Flex Dynamic Radio. All Rights Reserved.